Holi Day aka Festival Of Colours. The BBC News website posted a short video on March 29 under its “week’s weird videos” in “Newsbeat’s odd box” showing youths playing Holi in Utah (USA) and titled the segment as a “Filthy festival”. Hindu statesman Rajan Zed, in a statement in Nevada (USA), said that terming the “festival of color” celebrated by Hindus and others worldwide as “filthy” was very insensitive and belittling of the entire community. Zed, who is President of Universal Society of Hinduism, stated that BBC Director-General Mark Thompson and Trustees Chairman Lord Patten of Barnes should immediately apologise for this inappropriate terminology and hurting the feelings of one billion Hindus and publish it on the BBC website. Rajan Zed pointed out that under its “our values”, the BBC claimed “we respect each other and celebrate our diversity”, but describing a festival of the world’s oldest religion as “filthy” was highly “disrespectful”. Was calling Holi “filthy” the BBC’s way of educating and informing the world correctly; whose “mission” was listed as: “to enrich people’s lives with programmes and services that inform, educate and entertain”? Zed asked. Founded in 1922, headquartered in Westminster London, and established under the Royal Charter; the world’s largest broadcaster BBC (autonomous public service broadcaster) has been blamed in the past for racism, an imperialist stance, Indophobic bias, anti-Hindu bigotry, anti-American bias, etc. Helen Boaden is Director of BBC News and Diane Coyle is Trustees Vice Chairman. Joie de vivre festival of Holi welcomes the beginning of spring and starts about ten days before the full moon of Phalguna. The ceremonies include the lighting of the bonfires, during which all evils are symbolically burnt. Holi also commemorates the frolics of youthful Lord Krishna; celebrates the death of demoness Putana, burning of demoness Holika, and destruction of Kama by Shiva. 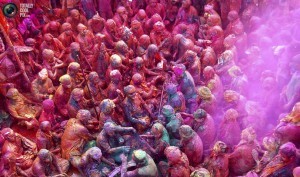 Holi fell on March eight this year. Webster’s New World Dictionary describes “filthy” as “full of filth, disgustingly foul; grossly obscene; morally vicious or corrupt“. Hinduism is the third largest religion of the world and moksha (liberation) is its ultimate goal. This entry was posted in Religion and tagged BBC has been blamed in the past for racism an imperialist stance Indophobic bias anti-Hindu bigotry, Hindus upset at BBC calling Holi “filthy”, Holi Day aka Festival Of Colours, Joie de vivre festival of Holi. Bookmark the permalink. The British Broadcasting Corporation (BBC) has apologised for labeling Hindu festival of Holi as “filthy festival”, which had upset the Hindus worldwide. Zed, who is President of the Universal Society of Hinduism, had complained to BBC saying that terming the “festival of color” celebrated by Hindus and others worldwide as “filthy” was very insensitive and belittling of the entire community. Admitting that the “original headline was an error” and saying “we are sorry”, Barlex informed Zed in the email that they have changed the headline to “Festival of colour”. I understand your concern that the use of the word “filthy” in our headline, in the context of this festival, could offend some audiences, Barlex added. Rajan Zed, in a statement in Nevada (USA, commended BBC for showing maturity and responsibility by immediately removing the inappropriate terminology used for the Hindu festival Holi, which hurt the feelings of one billion Hindus spread around the world. It was a “step in the right direction”, he added. Zed suggested BBC to provide training to their editorial staff in world religions as religion was powerful and complex and world was becoming increasingly diverse. Stereotypes, prejudices and caricatures passed on to us from previous generations needed to go. Journalism should take religion more seriously, and help us build interconnections and create harmony instead of adding to religious conflict, confusion and bigotry.